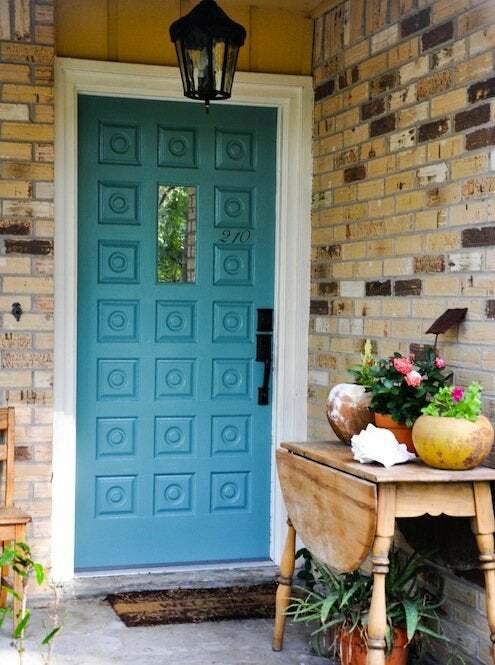 There’s probably no simpler, less expensive way to give your home a quick facelift than to repaint the front door. A new color can make your home look more welcoming, more dramatic, more quirky, or more cozy—all for the cost of a quart of paint and half a day’s work. Start by cleaning your door thoroughly, using a mild solution of water and dishwashing detergent. Scrape or sand off any flaking paint. Remove the doorknob and as much other hardware as you can. It’s not absolutely necessary to take the door off its hinges to paint it, but it’s easier to get great results if you paint the door while it’s lying flat. If your door has any stains or discoloration, or if you’re changing from a dark color to a lighter one, you may want to use a coat of primer first. Then apply your new color. On paneled doors, paint the panels first, then the outer sections, always following the direction of the grain. Allow the door to dry, and voilá—a whole new look!